> Not a subscriber? Subscribe Now! While game-changing 980-MPa grades already are being deployed, 1180-MPa grades are under development and are targeted for 2014 production-vehicle platforms. 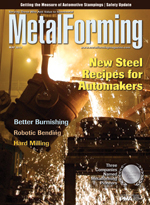 Parts-finishing experts weigh in on the growing trend toward vibratory finishing with steel media, and the adoption by stampers of continuous-flow finishing equipment to eliminate secondary operations and reduce costs. Made in China no longer makes good business sense to an electronics OEM, thanks in part to a New England sheetmetal fabricator providing significant cost savings through the use of press-brake-tending robots. The Holy Grail of measurement is to develop one system for the stamping plant that can potentially perform all of the required functions with reliability, repeatability and accuracy. Here we present the pros and cons of a few of the most common dimensional-measurement systems. While hard milling of stamping tooling can be tricky, manufacturers that follow the right protocol stand to benefit more from this machining practice than if they were to employ grinding, wire EDM or die-sinking EDM operations.